Happy Easter, everyone! This is my second post for the Seed GROW Project, organized by Mr. Brown Thumb, with nasturtium seeds (Tropaeolum majus 'Spitfire') donated by Renee's Garden. As shown in a previous post, I winter sowed some of the seeds in a milk jug on March 5 and some in a seed flat on March 6. 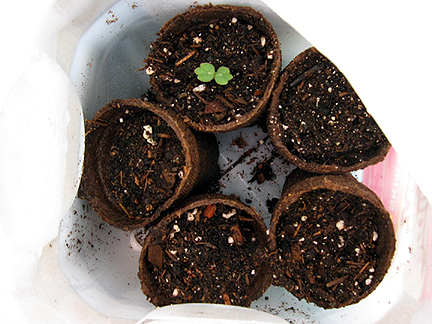 By March 30, the nasturtiums sowed in the seed flat had sprouted and their seed leaves were just starting to unfurl. Aren't they the cutest things ever? The ones sown in the milk jug had not yet come up. I think it's probably a bit warmer in the seed flats than in the milk jugs. Only a few days later, on April 3, five of the six nasties sowed in the flat had their full, unfurled seed leaves. (I don't know what's up with the sixth seed, but I'm sure it will sprout soon.) I love nasties because their seed leaves are so similar to their true leaves, unlike most plants whose seed leaves look like rabbit ears. On April 3, the first of the nasturtiums sown in the milk jug had popped up, too. The rest can't be far behind. I plan to grow some of the nasties up a chain link fence and others in my veggie garden. 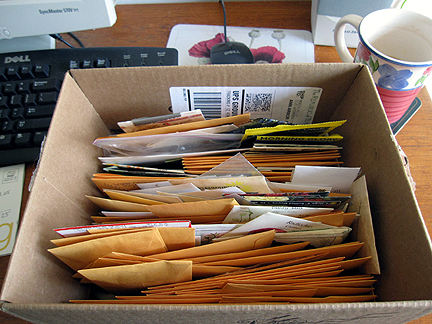 Back in January, I started two snail mail seed swaps, and both recently returned to me. After picking out a few seeds for myself (you guys sent some interesting stuff to pick from! ), I packed up the remainder and donated it to Growing Hope. Their director was excited to use the seeds for the Growing Gardens program. Thanks to all for participating, and hope you all found something you liked. Special thanks go to Frances, who had a lot of extra seeds to share. I've winter-sown most of them, though I'll direct sow a few in my newly cleared areas! Now you'll please excuse while I go nom nom nom eat my Lindt Easter rabbit which I've successfully saved for about 6 weeks now! Monika I love the NEW background to your blog! A wonderful breath of green for Spring!! That's a LOT of seeds! I have started mine from the seed swap. Can't wait to see how they do in the garden. Happy Easter! What did you pick from the stash that came back? I'm a little behind. I only have one batch out of the fridge so far. Showing a lot of promise! Happy Easter Monica! Hope that you enjoyed your bunny or have you saved some for tomorrow? :) The seed exchange must have been great fun. P.S. I like your new look- most green. Thanks for doing such an educational post on starting the seeds, Monica. I too love that the first set of leaves look like the true leaves on the Nasturtium. Also glad to see you've given the blog a new look with this template. Oh yes. Nasturtiums. After seeing how many of you winter sowed your nasties, I'm regretting not trying it. Do you think I still have time? I don't do many annuals with wintersowing, for some reason. You must be super woman to be able to save a chocolate bunny that long. I am not a chocoholic but I doubt if I could save a chocolate rabbit that long. Ha... Great seeds you got back. My winter sown seeds haven't sprouted. I wonder why?? Too dry? Too late planted?? Didn't hold my head right? Oh well I will try again some time. Happy Easter on you. Ooh, I bet they will look very pretty growing up your chain link fence. What seed swap site do you participate in? You seem to have hit the ground running this spring! What a great head start you have on your garden. 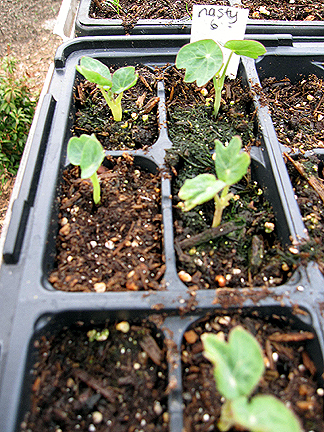 Have you ever tried to bring the seed boxes into your garage or warmer parts of the yard to "encourage" faster growth? You're off to a good start, Monica. I saw the cutest idea a couple years ago in a magazine. They grew nasturtiums over a dog house. I've been planning to try that. Your seedlings are looking great, Monica! 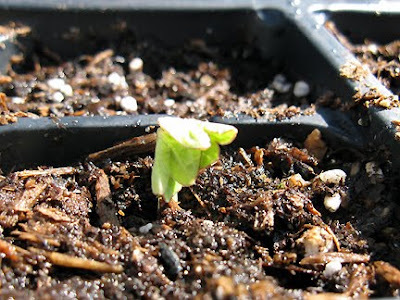 So far, the only one that has sprouted from my winter sowing is a sunflower. I'm hoping the rest are warming up and will sprout soon. I'm glad you posted the seeds you picked out; I wish I had thought to write down what I chose. I found my squash seed after I sent off the seed swap packet; if you would still like some, let me know. It's a combination of various summer squashes, including zucchini. I'm curious who included the Victoria Blue salvia--I've never tried to collect seeds from those before; I could sure save myself some money if I started doing that. I can't believe how many seeds you got! That is fabulous! Many of my little seedlings are just piddling along. The nasties seem to be the quickest growers though. Wow Monica, that's quite a seed haul! The nasty leaves are very cute - can't wait for mine to sprout! Enjoy that Easter bunny! Some people who shall remain nameless couldn't wait for Easter to eat their Lindt bunnies! ;) Yum! Monica. your seedlings are indeed cute! I think your idea of a chain link fence is a good one. Those nasties can really vine. A great use of the extra seeds and I will be sure to inclide plenty next year if you want to do the same. That is if you will consent to organizing the seed swap again! Hope the Victoria blue salvia grows well for you. I have several planted and most are up. Wow, that's a whole lot of seeds there. My zinnia are starting to sprout so I'll have to break out my lights soon. Next year even more seeds! So glad they are going to a good program. What a fun swap it was! I ran out of chocolate sometime a week ago, so today i had Sweet Cece vanilla, mint and chocolate ice cream with chocolate covered espresso beans...that's how I am still up commenting and catching up! Nasturtiums are my favorite edible flower, a 'must have'! Nice haul, Monica :) Isn't this weather amazing! Hehehe, I got a Lindt rabbit too! You got some great seeds there! I've potted up some of the seeds you sent me - the bunny tails have done well, but the heirloom tomatoes aren't quite as successful - yet! I'm getting ready to sow everything else outside soon ... impatience is setting in! The seed exchange looks like a success! It was very wise to donate to rest of the seeds, as there was no way you could use all of them. What a haul! Have a good weekend! Love nasturtiums and Lindt bunnies. Wow, you do have quite a list of seeds, Monica - we usually buy started tomatoes at local nurseries but I do throw a few flower seeds around. No one else will remember this ancient history, but your title made me remember the sixties soft-folk group New Christie Minstrels. On one of their albums they riffed on 'Tiptoe Through the Tulips' with the lyrics morphing and becoming more aggressive through 'tiptoe through the nasturtiums'...and finally "stomp through the Nasties". Your seedlings are doing great! I still have no germination from my wintersown nasturtiums, but when I get my indoor stuff going that will change (I hope!) I'm glad you had so many cool seeds to choose from, I am already collecting seeds to swap next year! First, I must congratulate you for the huge amount of will power you have shown by not eating your chocolate bunny until Easter. Wow! I can't tell you how many I went through while waiting for the Big Bunny to come to our house! Second, I love that you call Nasturtiums Nasties. I don't think I will ever be able to call them by their proper name again! Thanks for listing your seed picks--I was dying to know. I am going to have to try winter sowing. It looks interesting. Congratulations on the germination! I am waiting for my nasties to germinate! Great blog! I hope that rabbit was very yummy:) I don't know how I missed this post but I'm sorry:( Glad the nasturtiums all came up. They'll look great climbing on a fence. Monica I'm back again to see what's up..and looking at the sprouts oh Happy day! I also did a few seeds and they have finally sprouted through the earth.Herbs is what I did..soon to transplant into bigger pots.Monika you need to have a few seed giveaways!! Climbing nasturtiums are one of my top favourite plants. The leaves are wonderful. (Especially in the rain.) Their flowers are dramatic and the seeds reassuringly characterful in their colour, shape and texture. And if you live where they will happily self-seed - they make friends with you for life!